Kasco Robust - Aire RA1 System (Up to 1.5 Acres) - Aquatic Biologists, Inc.
A Robust-Aire™ energy efficient compressor injects air to the bottom of your pond with weighted, SureSink™ air line and into the Robust-Aire diffuser assembly. By using compressed air injected directly into the bottom of the pond, a continuous flow of water is moved upward and thousands of gallons of water are mixed with little expended energy. The diffuser breaks up the air into micro bubbles which rise to the surface. The rising of the air bubbles creates current which transfers low-oxygen water to the surface, allows it to contact the atmosphere and breath. Temperature layers are disrupted and fish are able to inhabit the entire water column. Oxygen levels increase and harmful gasses in the pond water are expelled. No motors or electrical components in the water, no restrictions which unit is in operation. Safe and efficient! The Robust-Aire RA1, RA2 and RA3 are available with post-mountable cabinets (includes steel ventilated cabinet with hardware to mount to a post). The post-mount system can be affixed to an interior shed wall or to an exterior post. eg: 6 x 6 pressure treated post near the pond. Every Robust-Aire system comes complete with all fittings and 100' of weighted airline per diffuser. ie: the RA3 comes with 3 diffusers, the complete compressor system in ventilated cabinet and 300' of weighted diffuser line. Robust-Aire diffusers are the most efficient on the market and create more water flow to aerate your pond. Diffusers are designed to provide a fine air bubble with the least amount of pressure. The base is made of thick HDPE plastic and a locking fill plug allows you to fill it with pea gravel or other weighted substrate. It has a raised design that keeps the diffusers performing at an optimal level above the pond bottom. 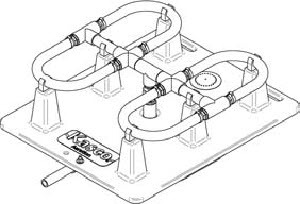 A durable, bolted, strain relief attachment ensures that the weighted tubing will not become detached during installation or maintenance. A check valve with Viton seals keeps water from entering the tubing when the system is not operating. Energy-efficient piston compressors provide efficient, continuous-duty operation with minimal maintenance and quiet operation. Units are extremely quiet. • Safely starts under pressure. Maximum operating depth 40 feet. Post mounted cabinet (PM) is mountable on an exterior wall or wooden post. (Free shipping still applies when the post mounted cabinet option is selected). Dimensions 19" x 12" x 12"H.
Suggested aerator system sizes come directly from Kasco and are recommendations only. Fish ponds, ponds with heavy nutrient loads, ponds with irregular shapes and ponds with muck problems or algae should have specific treatments. Contact us with questions if you are unsure of which Robust Aire system is best for you. *RA1 - RA3 pond size is based on a depth of 8 feet and a desire minimum turnover rate of 1 turn of complete volume per 48 hours.